In the campaign, Horowitz's group puts posters up on campus (as at right) that criticize student and other groups pushing for a boycott of Israel. He has focused so far on large California universities. While skirmishes over Israel boycotts are nothing new, these posters go a step farther than advocacy for one position or another. 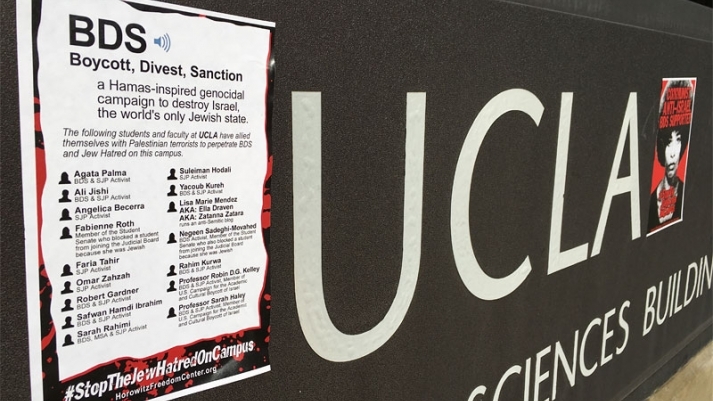 They list the names of students and faculty members who are involved in the boycott movement, and say they are supporting a "Hamas-inspired genocidal campaign to destroy Israel." Supporters of the movement to boycott Israel say these posters distort their views and are designed to scare people off of supporting their efforts. Defenders of the posters say if students back the boycott movement, they shouldn't be shocked to have their names associated with it. At issue on several campuses has been not only the campaign but the responses of administrators to it. At the University of California at Los Angeles, administrators took a tough stance, saying the posters violated university rules that limit what unaffiliated groups can put up on campus without permission. UCLA officials did not say the content of the posters violated university rules. But Jerry Kang, vice chancellor for equity, diversity and inclusion, issued a statement that took issue with the tactic of posters that linked student and faculty members, by name, with Hamas and others just because these groups favor an Israel boycott (which UCLA and the University of California as a system have rejected). "Listing people by name raises the stakes," Kang said. "The chilling psychological harm cast by such blacklist campaigns, especially when pushed into our physical campus grounds, cannot be dismissed as oversensitivity. If you don’t find these posters repulsive, consider your own name on them with whatever ludicrous stigmas that outsiders could conjure up. And if this isn’t enough, consider what might follow. What will you say when the next round of posters on campus includes photos, phone numbers, email addresses, home addresses, names of parents, names of children? These are not just hypotheticals. They have happened in other political contexts, such as the website called the 'Nuremberg Files,' which targeted individual doctors who provided lawful abortions." A statement sent out by the president of San Diego State University, in response to similar posters, placed more emphasis on the free speech rights of those who created the posters, and angered many pro-boycott students on campus. The statement from Elliot Hirshman, the president, said, "We recognize and fully support the rights of all parties to voice their positions on political issues, whether supportive or critical. We also understand that when parties adopt a specific political position they become responsible for their actions and these actions may produce criticism." Then the statement went on to raise issues about the use of names, but the San Diego State response was quite different from the one from UCLA. "At the same time, we wish to raise an issue for our community to consider. It is possible that the practice of identifying the names of individual students who participate in controversial political discussions, solely for the purpose of identifying them as proponents of a viewpoint, could discourage students from participating in political discussions," the statement said. "In this context, we write to encourage all members of our community to present their positions on important political issues, regardless of the nature of their position. We also wish to explicitly note that we strongly endorse our university policies protecting freedom of expression. We raise these issues to strengthen our tradition of vibrant discourse about ideas and issues and encourage all members of our community to participate in these discussions." A group of San Diego State students, angry the response was not stronger, surrounded a car carrying Hirshman late Wednesday and wouldn't let it move for two hours. They said what they considered a weak response suggested he agreed they were terrorists. The San Diego Union-Tribune  reported that at one point Hirshman got out of the car and gave something of an apology to students, saying, "If we have done things inadvertently that have upset or hurt people, we are sorry for that." Horowitz has issued a response  to Kang's statement about the posters at UCLA, saying, "The posters don’t cast those listed on them as murderers and terrorists, just activists from Students for Justice in Palestine who supported the boycott campaign." Horowitz added: "This disgraceful performance by a top university official demands a retraction and apology from the University of California and some serious reflection by Vice Chancellor Kang about the hateful content of his letter and the focused, personalized intimidation directed at myself and all those involved in putting up posters he happens to disagree with."